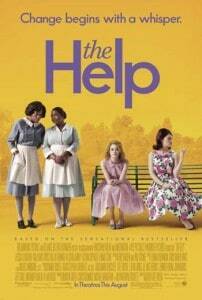 Many of you have probably read The Help, but have you seen it in theatres yet? Or maybe you haven’t read the book, but you are curious about the movie that EVERYONE is talking about. Stacie and I both got opportunities to see a special screening of it in California (at different times, unfortunately! ), and both really loved it. The Help is about the relationship between influential white women and the African-American women that are their “help”, acting as house maids and nannies. Kathryn Stockett has written some of the most memorable characters that I have read about in a long time, and it was amazing to see them come to life on screen this summer. Allow me to introduce you to Aibileen, Minny, Skeeter, and Hilly. Once you meet these powerful women, you will never forget them. My thoughts: I loved Aibileen. She has this fire in her; you can see in her eyes how much she detests working for Elizabeth, but she feels so powerless to do or say anything about her situation–until Skeeter lets her know that someone is willing to listen to her. My favorite moments with Aibileen are when she is caring for Mae Mobley. That sweet baby girl is what keeps her going! Though Viola Davis is younger than the Aibileen in the book, I cannot picture anyone who was more right for this part. My thoughts: Hilly Holbrook is just awful! People are so afraid to think differently than she does, and that really comes across in Elizabeth in a few places, and even Skeeter in a moment or two. I would be afraid to walk on the same side of the street as her. Dallas Bryce Howard plays a perfect ice queen–and she’s really not one in real life! Well done, Ms. Howard, well done. My thoughts: Minny was my one of my two favorite characters in the book, and one of my two favorite characters in the movie. (My other favorite is Celia Foote, played by Jessica Chaplain.) I’ve loved Octavia Spencer since I first saw her in Never Been Kissed in a very short scene with Drew Barrymore. I always get excited when I see her pop up in movies and TV shows, but this movie really lets her shine. I love her sass, and her facial expressions. This part was meant for her, and no one else! My thoughts: I’d only seen Emma Stone in one movie prior to seeing The Help, and I was on the fence how I felt about her in this role. Once the movie started rolling, I realized she was perfect. She plays awkward really well, has the crazy hair, and the long limbs and stature that define the character of Skeeter. I also think her sort of raspy voice fits well, too. Simply put, I loved her and will be stalking her IMDB page to see what’s next for her. I tryly truly loved it! I hope the author writes another book! I could see the movie again…. I really want to see this movie.